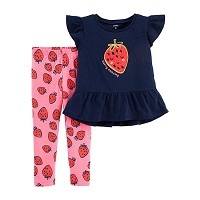 Whether your child needs new gear for back to school or is looking for some seasonal wear that's ready for any weather, you can always count on there being quality kids' clothes for sale at JCPenney, no matter what time of year it is. From activewear for summer activities to stylish shirts and jeans that are perfect for the classroom, there are plenty of items your child can wear, all at an amazing price. Take a look at some of the deals on kids' clothes to take advantage of. Load up on classic and cute formal wear. American Princess makes amazing and colorful dresses. She’ll love all the ruffles and sparkles! Get a great deal on communion dresses, church dresses, flower girl dresses and more. Buy your little fella dapper suit and vest sets. Your kids can’t have enough swimwear for the summer. Our kids’ clothes sale is the best time to buy them. You can really stock up on enough bathing suits and swim trunks for your kids to rotate. While spending less on discount kids' clothes is nice, finding great deals on snazzy shirts your kids will love is even nicer! 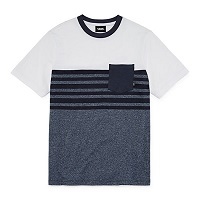 Trying to buy some shirts that are both charming and lively for your boy? You'll find marked prices on everything from classy striped long sleeve shirts to sports-themed T-shirts great for being active outside. Shopping for something elegant or playful for your girl? 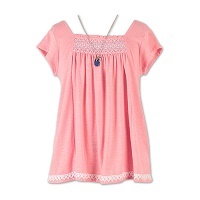 Shirts on sale for girls range from trendy tops to graphic tees that will make a statement. You won't have to spend a bundle finding quality pairs of bottoms for your kid. Whether you need some casual shorts for spending quality recess time in or you're in need of scoring a deal on something more formal like a pair of khaki slacks, there are many types of bottoms available to purchase, all for a reasonable price. Now is the time to save big on some dress pants for your boy or some dresses or skirts for your girl.